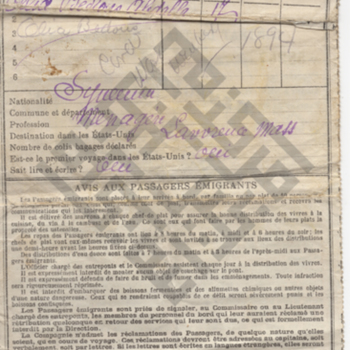 An immigration record from Marseille, France, created on September 16, 1911. The record lists Alice Abdalla [born 1894] as immigrating at age 17 in 1911. On the back of the record there are a series of questions with information including: her profession (menagere, or housewife), the fact that she could read, that it was her first trip to the United States, and that her destination was Lawrence, Massachusetts. Compagnie Générale Transatlantique and General Transatlantic Company, “Alice Abdalla Immigration Record,” Moise A. Khayrallah Center for Lebanese Diaspora Studies Archive, accessed April 21, 2019, https://lebanesestudies.omeka.chass.ncsu.edu/items/show/22076.